Extraordinary biographical novel of Gypsy singer Nadezhda Plevitskaya (1884 - 1940) who rose from the camps to become the inspiration of composers Serguey Rakhmaninoff and Yigor Stravinsky. As Plevitskomania swept over Russia she became accredited to the Tsar's Court. For the first time told in full, this historical novel, or work of narrative history, offers an insight into the life of a revered performer who fell from grace in exile. The book was written to entertain, astound, and enjoy. 'LA PLEVITSKAYA' is meant for a readership between 12 and 82 and offers an insight into the time of Tsarist Russia which saw so many leave for far away shores. It contains a glossary and a relationship diagram how Plevitskaya related to the movers and shakers in her lifetime. Ally Hauptmann-Gurski is an Australian samizdat author who grew up in West Berlin, studied sociology, and managed Russian folk music groups for years. She was also a journalist, secretary, festival organiser, and translator. She is now semi-retired and stills plays her bass balalaika (see back cover). She discovered Nadezhda Plevitskaya through owning the Plevitskaya tambourine and found a paragraph in a Rakhmaninoff biography. This became the starting point for her research in three languages. Her work with Russian musicians and emigrés enabled her to look beyond the obvious, so the novel is a backstage view of this Gypsy singer's life. 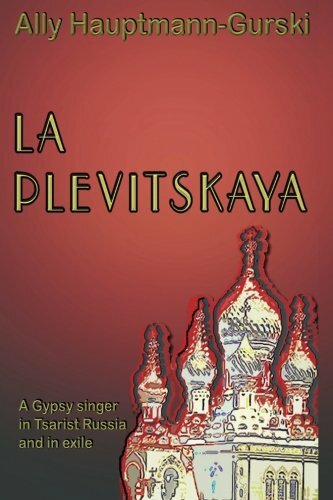 LA PLEVITSKAYA is based on historic events but contains fictional scenes to connect the dots – a bio-pic in book form. 'I have known many emigrés and artists in Berlin, Frankfurt, London and Australia. I heard their stories which made it possible to fill the blanks that you see in history books. The best compliment that I received in the pre-publication process was the question if I was related to Plevitskaya because my book reads as if I had been there. Suprisingly, it has been difficult to fit LA PLEVITSKAYA into one of the standard catalogue categories. The category used for movies, the bio-pic is probably closest.' Writing and playing Russian music, plus the secretarial work that a music group generates, does not leave her a lot of time for other hobbies, except for small political comments on fora. Does knowledge and experience carry an obligation, even when you should shut up? Difficult question that is. Favourite quote: Veritas non olet.